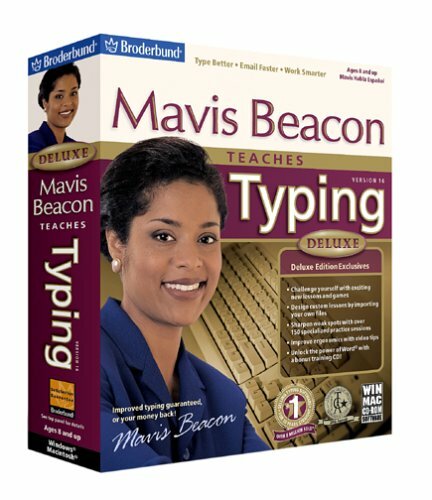 Mavis Beacon is bright and helpful - "the world's greatest typing teacher for Mac" some would say. And for 25 years, her generous smile and competent demeanor have helped countless typists keyboard correctly. Mavis Beacon Teaches Typing makes it fun to improve keyboarding skills with typing practice and games that focus on speed, accuracy and rhythm. Mavis Beacon Teaches Typing utilizes a proven method of typing instruction to help keyboarders..
improve keyboarding skills with typing practice and games for Mac OS X. ...... Mavis Beacon Teaches Typing utilizes a proven method of typing instruction to help keyboarders, from novice to experienced, improve typing skills. Whether you want to learn essential keyboarding skills or improve overall typing efficiency, Mavis Beacon Teaches Typing For Mac will guide you step-by-step on your road to success! Improve your speed and accuracy with detailed assessments, customized lessons and skill-building games in English, Spanish, and French (Platinum Edition only). Qweas is providing links to Mavis Beacon Teaches Typing For Mac 2011 as a courtesy, and makes no representations regarding Mavis Beacon Teaches Typing For Mac or any other applications or any information related thereto. Any questions, complaints or claims regarding this application Mavis Beacon Teaches Typing For Mac 2011 must be directed to the appropriate software vendor. You may click the publisher link of Mavis Beacon Teaches Typing For Mac on the top of this page to get more details about the vendor.